Research shows that there are 4 layers of meaningful connections that our brain can manage. Try map your friends accordingly and see how they move on your map throughout time. Learn more about your friends. Use our profile template as a general guidebook. Get inspired by the questions and initiate a great conversations with your friends. You can also create your own questions by using the field “Additional Info”. Struggling to remember the name of a particular friend? 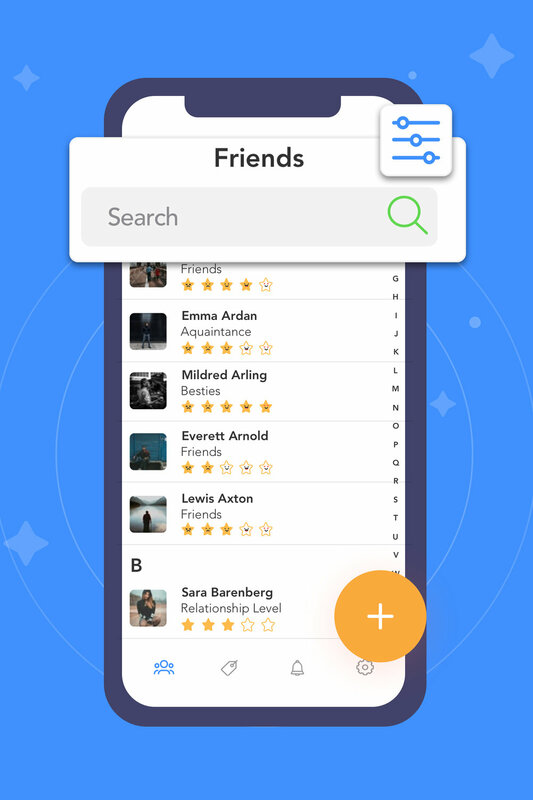 As long as you remember something you have put in the profile page of that friend, you can search by keyword and find your friend quickly. Never forget where you left from the previous conversation and always know how to catch up! Simply add a *Memory* and review it whenever you want. Create a habit of writing a friendship journal and reflecting back on your shared memories. It helps you to be more aware of how you interact with others. It is as easy as to just answer a question, write down what you want to remember, and rate how you feel. 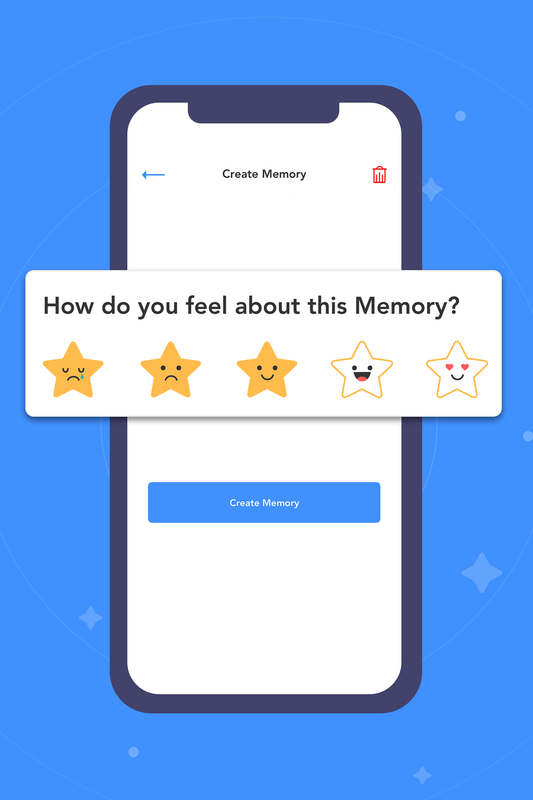 You rate every "Memory" based on how you feel. This can always be changed if you review this "Memory" later and feel differently. We take the average of all the *Star Ratings* and show you how much you enjoy spending time with your friend in general. See who is sitting where on your friendship map, and who you enjoy spending time with the most. Set goals and make conscious effort to either get closer to an amazing friend, or to distant yourself from a toxic one. Create a to-do list just for your relationships and manage them in one hub. Keep promises you’ve made to your friends and follow up with your friends on what they've promised to you. 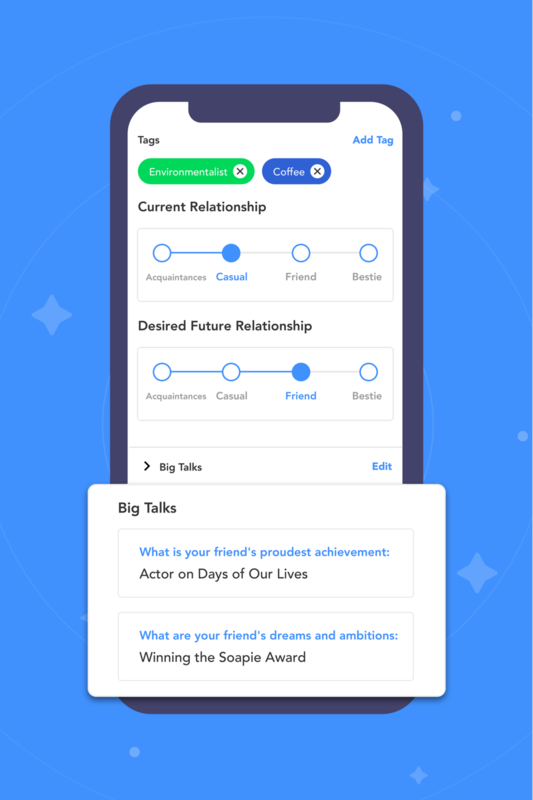 By using Tags, you can group your friends and create your own circles based on how you met them, what they are all about, and other shared interests, values, and traits. Collect shared *Memories*, see them grow into a beautiful *Storyline*, and revisit a *Memory* at any time.